Are you ready to change the way you think about paint? Are you ready to add some texture, some definition and take the old piece from drab to fab? Are you ready to take any paint flat to high gloss and turn it into something that will make your friends, family, and customers say HOW DID YOU DO THAT?? 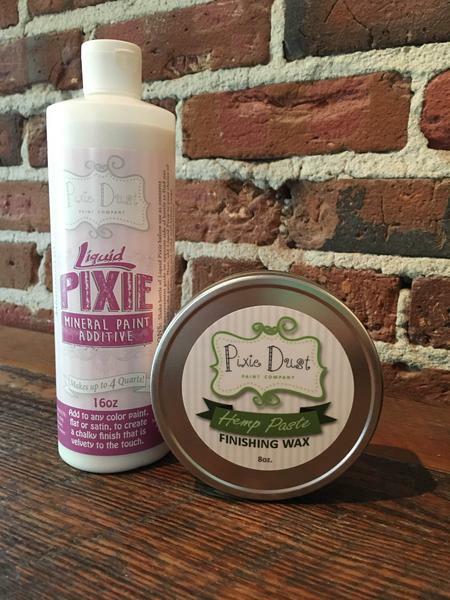 Like all of our Pixie Dust Products, Pixie Texture is 100% all natural, non-Toxic and contains NO PLASTER OF PARIS, GROUT, TALC or any other material that is on the California Proposition 65 List of cancerous causing materials. Pixie Texture is super easy to use, easy to clean up, and the results are breathtaking. It can be used with ANY type of paint from Flat to High Gloss, as well as craft paints. Sealants depend on the type of paint you use as some don't required to be sealed at all (high glass and metallics). 1 bag is enough to cover 7 kitchen cabinet doors (if using the roller technique). Coverage will vary on the amount of paint you use per project and the consistency of the paint. The thicker the paint the less texture needed.